My students were very excited to read a book that President Obama wrote. This book had a really interesting and different take on educating about a lot of famous, strong individuals that made huge differences in our life. I took interest in this book after seeing a headline from Fox "News" that said: Obama Praises Indian Chief Who Killed U.S. General. Since Fox is truthful and "fair and balanced" (they couldn't say that about themselves if it weren't true, could they? ), I realized that all the books I had read about Native American history must be all wrong. So, Custer was not a Lieutenant Colonel like all the history books say, he was really a General; Sitting Bull didn't stay in camp during the Battle of Little Big Horn like all the history books say, he was really right there in the thick of it, and he personally dealt the mortal blow to Custer; and the death of Custer wasn't the result of native people defending their lives, liberty, culture, traditions, and families from invading forces who meant to take all of that away from them (again, as all the history books imply), instead, those ruthless Indians purposely went out of their way to kill poor innocent whites (who were just minding their own business). I am so indebted to Fox for opening my eyes about this chapter in U.S. history. Okay, I'm done with the sarcasm. I read this book at a Borders bookstore. It was short, the majority of each page consisted of illustrations that were well-done and pleasing. Each two-page spread is dedicated to someone in U.S. history who has demonstrated some noble attribute in his/her life. The words and the pictures are meant to inspire young children, and well it should. 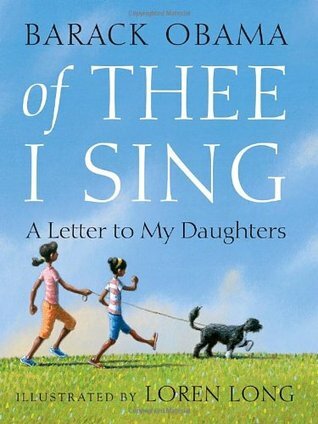 Of Thee I Sing: A Letter to My DaughtersRead this at the library a couple of months ago, this short book is at once a series of history lessons and a lovely letter from this very well known author to his daughters.The book includes bios of George Washington, Abraham Lincoln, Jackie Robinson, Billie Holiday, Cesar Chavez, Helen Keller, among others.A charming short book that can teach little children how one person can inspired millions and change the world for the better.I recommend it for elementary teachers and those with small children (the book is recommended for children as young a 6 years old).There's also an audiobook version, which I would had purchased had Obama narrated it, but they had someone else do it. Full disclosure: I admire Barack Obama and am particularly smitten with him as a father, with his family. I think that he has a lovely family and that he and Michelle are marvelous parents, and the girls seem like truly nice people.The concept of this book is that Obama is writing a letter to his daughters about how he feels love for them and his hopes for them, all the time educating them about people who have made a difference.It might be thanks to the illustrator, Loren Long, that this book is ingenious in its execution.For every attribute Obama mentions (creative, smart, brave, a healer, have your own song, being strong, honoring others’ sacrifices, being kind, not giving up, an explorer, are inspiring, are part of a family, are proud to be an American) he tells a little about various people in history who exemplify those things. The people he introduces are Georgia O’Keeffe, Albert Einstein, Jackie Robinson, Sitting Bull, Billie Holiday, Helen Keller, Maya Lin, Jane Addams, Dr. Martin Luther King Jr., Neil Armstrong, Cesar Chavez, Abraham Lincoln, and George Washington. (At the back of the book, there is a short biographical paragraph on each of them. )But what’s brilliant about this, aside from introducing some inspiring people, is that the illustrations show Obama’s two girls and then each of the famous people as children. As each person’s contributions are discussed, they appear with Obama’s daughters on the next page. So, the two girls are joined by more and more people, until there are many children going forward together, as each one joins the group. I found it inspiring, especially since the focus is on the diversity of people that make the country great. It’s children who are shown here, even if the accomplishments being talked about weren’t brought to fruition until their adulthoods.Some pictures of Bo, their dog, make it into the book, and I can never resist a cute dog.I am far from a raving patriot, and I often don’t like “patriotic” books, but I am fond of this book. I appreciate that the people featured made contributions in all sorts of different ways, and I admire most of them, so that probably influenced how I feel about this book. For some readers this book will be an unappealing celebrity book or too didactic or political, but I enjoyed it.The illustrations are great, showing the featured people as kids and having them come from all sort of backgrounds making all sorts of contributions will help make history come alive even for kids not normally interested in the subject. There is something here to interest almost everyone. I loved this book! It is a letter written by Barack Obama to his little girls. On each page, he begins "Do you know you are _____?" He fills in the blank with a characteristic, such as brave, strong, etc. He then talks about a famous American that also embodies this trait. It is educational, but also very sweet and heartwarming. It definitely could be used to boost children's self esteem and self confidence. This book also pertains to various social studies topics due to the use of the famous Americans, and I love that it is written by our current president! Sometimes less is more. And that's the case here. This simple little book has a powerful message for children and for us all. Very inspirational. It only takes a few minutes to read. The illustrations are beautiful. This book is something special. I saw it on the rack at B&N and sat down to take a quick look. But as soon as I began reading, I knew it wasn't going to be just a quick look through. President Obama writes the book as if it were a letter to his daughters. The story or letter, as it were is lovingly written and the illustrations beautiful. Obama begins each page with"Have I told you . . ." Telling his girls how wonderful, strong, and kind they are. Subsequently highlighting a historic figure from American history that emulates these characterisics. From Jackie Robinson to Abe Lincoln, I smiled and shook my head with pride as I read about each and every figure. My favorite part is at the end, after 13 strong historic figures are highlighted, he writes.. . "And have I told you that they are part of you. and You one of them." Beautiful I tell you just beautiful. It gave me such delight to read this book to my little sisters.---and to be honest to read it all on my own, many times. It warmed me to the chore. A well written book indeed. I'm not an Obama fan. (I'm exactly whatever is the opposite of 'fan' when it comes to him.) I've seen this book in Wal-Mart for quite some time now and rolled my eyes each time. I assumed I'd know exactly what was inside. In short, a cheesy, for the media book written "for" his daughters. I expected to hate it. I expected to make fun of it. I expected that I'd never, ever, ever read it to my daughter.But it's good. And it's not just 'good'. It's 'really good'. It's almost five stars good to be exact. I'm still blown away and I read this while walking around Wal-Mart yesterday afternoon. I wouldn't buy this. Unless the money went 100% to charity I wouldn't put a penny in that man's pocket. But I will check it out from the library in order to read it it Julia. I do believe it's a fantastic book for children. I liked the diversity. There aren't just black people, there aren't just white people. There are all sorts of people who did all sorts of different things. I'll admit that this is the opposite of what I expected. All in all this is a beautiful book. And after writing this I decided that it's deserving of more than four stars. I'm going to put five stars on here but it's just slightly less IMO. So, 4.5. This book just may be the best thing that man has ever done. Of Thee I Sing is a moving letter Barack Obama writes to his daughters. Though intended for children, the message is universal. The illustrations are gorgeous and the theme relevant. For every trait that the former president attributes to his daughters, there is a notable person that best represents that trait. The simple format of the book highlights the powerful message: our individual traits are stronger working together rather than apart. A memorable book. Fun fact, Obama is the first sitting president to publish a children´s book and the third president to publish one at all. I love this book! There are so many ways a teacher can use this book. I would most likely use this book in a history lesson because of the great historical references made of many inspiring historical Americans. The illustrations are beautiful. You could have your students research the people mentioned in the book as well as President Obama. In the back of the book there are a few facts about the different people mentioned in the book that have help build our country to be what it is today. This would be a good resource for students to start their research! Seingat gue, dulu pernah baca buku ini di perpustakaan anak yang ada di Dharmawangsa Square. Ketika lagi semangat-semangatnya mencari perpustakaan yang seru untuk dikunjungi. Hari ini gue mendengarkan seseorang mendongeng cerita di buku ini di Youtube. Masih tetap menyenangkan mendengar cerita-cerita di dalam buku ini. Kalau bisa gue simpulkan, buku ini adalah hasil rangkuman profil idola Barack Obama yang ingin dia kenalkan kepada anak-anaknya. Idola yang ia harapkan menggugah mereka untuk tumbuh menjadi pribadi yang dibanggakan. Yang paling penting dari buku ini adalah dia ingin menyatukan rakyat Amerika yang sedari dulu punya isu rasialisme yang cukup pelik. I tried to approach this book as simply a picture book, ignoring the "celebrity author" and Presidential status of its author. I figured that would be the fairest approach, trying not to prejudge for better or for worse. And, I ended up really enjoying it! A few phrases got a bit overly poetical or did not flow or match as perfectly as they could, but most were pitch-perfect and very touching. I really appreciate the sentiments about how children can learn from those outstanding individuals who went before them and how there are so many individual traits that make a strong American--and member of the human race. The illustrations are fabulous! I love how one page shows the child-versions of the great Americans, standing beside Obama's own daughters, and how the children begin to swap the "tools of their trade" with one another, sharing their gifts and showing that we can all try new things. I feel I should point out that this book generated some controversy with the inclusion of Sitting Bull as one of the famous figures to look up to. This controversy comes from both sides as some consider the inclusion of a Native American who killed a US General to be anti-American (http://www.aolnews.com/2010/11/16/fox...) whereas Sitting Bull's great-grandson is upset that Obama misquoted his great-grandfather and further feels that Sitting Bull should not be included in a book about famous Americans in this way, "my great grandfather was never American. He was Lakota." (http://americanindiansinchildrenslite...) Some controversy also surrounds the fact that the illustration of Sitting Bull gives him the only non-human form in the book (his face is made up of mountains, trees, etc.). Personally, I am not sure I would have found anything to incite my feelings one way or the other when I read that particular segment of the book--taken in the context of the rest of the story, I think Obama was probably just trying to include a wide variety of people for children to look up to--it's blatantly obvious he is trying to be multicultural given the figures he has chosen for the book. However, I can certainly understand the perspective of Sitting Bull's grandson and do think that when the President of the United States publishes a book during his time in office, he or one of his secretaries or editors, ought to have done more thorough research to ensure that he did not offend the Lakota people.Also, the blurbs about Abraham Lincoln were quite typical with the whole "freeing the slaves" bit and not really going into the full story regarding his Emancipation Proclamation, etc. Still, all in all, I think this is a very worthwhile book to share with young people--its heart seems to be in the right place and I very much enjoyed its inspirational message, poetic style and gorgeous illustrations. Hopefully it will interest children in looking deeper into the famous persons represented here and they will gain a more thorough understanding of each person in that regard. To check out my reviews: https://dancinginth3dark.wordpress.co...When I originally read this children's book, I wanted to make this an extravagant post about the former President during this chaotic transition of power and how I will deeply miss him and how he brought honor and respect to the role of President even though a good percentage of the country wanted to see him burn at the stake or worst. But as time has gone by and the laziness that has kicked in because of school I've decided to simply stick to the book and not the author.I was disappointed with this children's book for the simple fact that it is misleading and does not feel like the author actually wrote it or rather gave the idea but did not execute it well. Of Thee I Sing is a book that Barack Obama wrote in dedication to his daughters and teaching them about women empowerment and how these countless icons have helped paved the way for women especially women of color and how the roadblocks that were presented in their life did not stop them from pursuing their true potential as human beings.Obviously I am an adult so I knew plenty of details of the women that the author illustrated for this book but if I were a kid I still would not have a clue about half of these women and why are they so significant in the 21st century. I could be completely wrong but I did not feel the passion of how this book was put together and I do believe it is important for kids to read it because there is tons of individuals from all walks of life who has changed the world in one shape or form and do not get the recognition because people want to erase them from history or they do not want these individuals planting the necessary seeds in our subconscious to let us know that we can accomplish anything if we set our minds to it regardless of gender, race, or sexual orientation. I wish I could have given it 5 stars especially since I miss Barack Obama and despise how our current leader has brought nothing but disrespect to the Oval, to its constituents, and our country across the globe. I try to stay away from being political on Goodreads because I believe this site is the ideal place where we can share ideas and not judge those who may have contrasting ideas so I will end my review here for now. The Story: This is exactly my kind of book. It provokes meaningful discussions between parents and children, teachers and students. Who was Jackie Robinson? Why was he important to history? Who is Maya Lin? What was the significance of the Civil War? the Vietnam War? The pivotal conversations that this book evokes are innumerable. The Artwork: I had the privilege of listening to Loren Long [insert link to his site: http://www.lorenlong.com/] present at the scbwi 2010 Summer Conference. I was awed by his creative genius, and this book takes my admiration of his talent to a whole new level. He depicts many layers of nuance and conveys so much meaning through the extraordinary illustrations in this book. I was especially moved by his portrayal of Sitting Bull.The Passion: The love, respect, and admiration the author feels for his daughter is so palpable in this book that I cried as I read it to my own daughters. It is also clear how the author defines strong character and what he values most about our country by not only the heros he chooses to admire but also through his evocative word choices.The Message: The underlying message is that all of these groundbreakers were once children, just like the readers, and they hatched the ideals that shaped our great nation. The take away message to children is that they can make a difference. Dream, and then make it so.My Only Issues: My only suggestions for improvement are: (1) I wish the book was more environmentally-friendly, that is, printed on recycled paper and without a dust jacket; and (2) I wish that the author had reframed the question about being smart. Had he read Dr. Carol Dweck’s Mindset: The Psychology of Success [http://bit.ly/b78OaN], I’m sure he would have praised the amount of effort his children exude vs. how “smart” they are.The Conclusion: Buy [http://amzn.com/037583527X] or borrow this book and read it to the little pickles in your life. I will be giving it as a gift for a long time to come, and I imagine that you may do the same. What a great inspirational book for children! Yes, you can be anything you set your mind to!Loved the illustrations! An amazing anthology of famous, world-changing role models who can inspire and guide the future generation, never letting them forget how smart, strong, courageous, and wonderful they are. I honestly can't believe the direction our country is currently headed in, but I'm so happy and grateful that we have a book like this with which to teach our children instead of just allowing them to believe that bullies always win. Thank you, President Obama. I just loved the direct and simple way in which Barack Obama manages to tell his Daughters about 13 major figures of the USA history, at the same time as he writes them a letter which is a way of appealing to the best in them. Lovely and inspiring.Maria Carmo,Lisbon, 30 July 2017. I read to 10-yr-old granddaughter; she loved the book. She said "he (Barack) is a really good dad"! Going to get her J biographies on Jane Addams & Sitting Bull. Goodreads description:In this tender, beautiful letter to his daughters, President Barack Obama has written a moving tribute to thirteen groundbreaking Americans and the ideals that have shaped our nation. From the artistry of Georgia O'Keeffe, to the courage of Jackie Robinson, to the patriotism of George Washington, President Obama sees the traits of these heroes within his own children, and within all of America’s children.Breathtaking, evocative illustrations by award-winning artist Loren Long at once capture the personalities and achievements of these great Americans and the innocence and promise of childhood.This beautiful book celebrates the characteristics that unite all Americans, from our nation’s founders to generations to come. It is about the potential within each of us to pursue our dreams and forge our own paths. It is a treasure to cherish with your family forever.There was a great deal of hoopla over this book on the library listservs I follow. Of course that made it almost impossible to read this book objectively. What was frustrating about the discussions on the listservs was that they focused not on the quality of the book, but on 1.) as president what was he doing writing a book when he should have been running the country and 2.) did he really write the book – of course he had to have had a ghostwriter.President Obama may be the first sitting president to release a book, but I could not find anywhere that said the book was written after he took office. Personally, I don’t really care when he wrote it. That’s a political issue and this is a children’s book. Books for children should not be political.As for whether or not he wrote the book or just added his name – I honestly don’t know. I couldn’t find any authoritative sources one way or the other. It’s not uncommon for well-known people to lend their name to a work in order to increase sales or what not. Many politicians have certainly done so.All of the political grumblings aside, the question remains, is this a good book?I think so. It’s a feel good story for young children. It provides a very positive message, something we all want for our children. The illustrations are beautiful.My favorite line is “Have I told you lately how wonderful you are?How the sound of your feetrunning from afarbrings dancing rhythms to my day?How you laughand sunshine spills into the room?”My political views do not follow President Obama’s, but I didn’t find this book to be a political statement. Rather, it is a positive book to share with children (not a bad one for adults either), but be sure when you pick up this book you put down your political opinions and read the book for what it is – a feel good book for children.Recommended for Kindergarten to 3rd grade.Mrs. Archer’s rating: 5 of 5. I am naturally leery of celebrity-authored books. Especially celebrity-authored picture books. So it's taken me a while to get to this one, but I am so very pleased with it. It's beautiful, really, in both the words and the illustrations. Mr. President has a way with words (like that's a surprise):Have I told you lately how wonderful you are?How the sound of your feet running from afarbrings dancing rhythnms to my day?How you laughand sunshine spills into the room?What child would not want to hear those words from his father? I appreciate the inclusion of uncommon heroes for our children: Jane Addams, Billie Holiday, Maya Lin.I appreciate the fact that Obama didn't feel the need to force this into a rhyming book.I appreciate Loren Long's delicate acrylics, and the way they embody the spirit of each hero.I appreciate the dedication:"To Michelle--whose fierce love and daily good sense have nourished such wonderful daughters. --B.O. "I can't imagine a more wonderful tribute to a woman from the father of her children. This is a must-have for elementary libraries, not so much for the relevance of the author in our children's lives, but for the historical and encouraging social content. I listened to the 16 minute audio version of this and was then compelled to check out the actual book from my local library. It's a great book for kids to learn about important figures of U.S. American history. The illustrations are great and the text is very well written. Highly recommend. I can't say enough good things about this book. This beautifully illustrated picture book was wonderful to look at and the story was charming. As a parent, I often think of letters or things that I want my children to know. This is exactly the type of thing that I would like to write to my son. Praising a child for attirbutes such as being kind and strong is so important in building their self-esteem. I also loved how some of America's most important pioneers were noted and discussed. At the end of the book their was also a bibliography of each notable person discussed. Young children and older children would benefit from reading this book and since there is so much cultural diversity and civic duty represented in the book, it would make a wonderful addition to the classroom. I read this book to my five year old in the Marshfield Public Library this morning. I loved it. President Obama presents a very moving portrayal of America through brief biographical sketches of famous Americans, linking each person to something he wishes his daughters to learn about themselves and their country. Albert Einstein, Sitting Bull, George Washington, Helen Keller, Neil Armstrong, Jane Adams, Jackie Robinson, Caesar Chavez...it was all very nicely done. I may have to buy this one for our permanent library. Say what you like about President Obama: the man can write. Both of his other books were very well done as well. I wonder who thought the idea of this book up? It reads like a spin-doctor's idea of a way to 'unite America' and mention loads of historically important people making sure that the selection is racially diverse. I liked the illustrations and the book was beautifully produced but the prose didn't move me at all. Maybe if I'd been an American I would have felt differently, but I'm not, I'm a West Indian and that means I'm support Obama but have no US party allegiance at all. "Have I told you that you are a healer? "In this picture book, Obama introduces different Americans to his daughters (including Sitting Bull, MLK Jr., & Jane Adams), while reaffirming their beauty and self-worth. It's much more a collection of brief biographies than a book about the relationship between a father and his daughters. A taste of history at an early age can inspire a life-long passion. General:- much shorter than I anticipated (audiobook was only 15 minutes long)- thought it would be more essay style, but it was a very poetic letterLikes:- the Americans chosen were very diverse in terms of time period, reason for fame, gender, and race.- would definitely read as bedtime story to young children- loved how encouraging and affirming it was ("Have I told you that you are kind?" "Have I told you that you are creative? ")Dislikes:- the biography part of the 13 Americans was short and could've included more pertinent information. This isn't exactly what I was expecting, but I enjoyed it more than I thought I would. (Is that ambiguous enough for you?) Instead of focusing on his daughters themselves, Obama chose to give examples of famous Americans' characteristics and how he sees them/hopes to see them in his daughters. This is more a celebration of all American children, and as such, it does a pretty darn good job. I didn't love the style of the illustrations, but I thought they did a great job of tying the book together as a whole. Barack Obama Loren Long - Barack Obama was the 44th President of the United States of America. He was the first African-American to be elected President of the United States and was the first to be nominated for President by a major U.S. political party. He was the junior U.S. Senator from Illinois from 2005 until he resigned on November 16, 2008, following his election to the Presidency.Barack Obama is the son of Barack Obama, Sr. and Ann Dunham. He graduated from Columbia University in 1983, then moved to Chicago in 1985 to work for a church-based group seeking to improve living conditions in poor neighborhoods plagued with crime and high unemployment. In 1991, Obama graduated from Harvard Law School where he was the first African American president of the Harvard Law Review. In addition to his work as a community organizer, Obama practiced as a civil rights attorney before serving three terms in the Illinois Senate from 1997 to 2004. He also taught constitutional law at the University of Chicago Law School from 1992 to 2004. During his eight years in the Illinois State Senate, Obama worked with both Democrats and Republicans to help working families get ahead by creating programs like the state Earned Income Tax Credit, which in three years provided over $100 million in tax cuts to families across the state. Obama also pushed through an expansion of early childhood education, and after a number of inmates on death row were found innocent, Senator Obama enlisted the support of law enforcement officials to draft legislation requiring the videotaping of interrogations and confessions in all capital cases.As a member of the Democratic minority in the 109th Congress, he helped create legislation to control conventional weapons and to promote greater public accountability in the use of federal funds. He also made official trips to Eastern Europe, the Middle East, and Africa. During the 110th Congress, he helped create legislation regarding lobbying and electoral fraud, climate change, nuclear terrorism, and care for returned U.S. military personnel.President Obama is especially proud of being a husband and father of two daughters, Malia and Sasha. President Obama and his wife, Michelle, married in 1992 and have a home in Chicago’s South Side.